There is a saying in Greek, “I Ellada pote den pethainei” (Greece will never die) and today I saw why this is true. I’d gone to the Public Power Company (DEH) office to pay my son’s bill. No, I’m not a doting mom with a spoiled child. My offspring left Athens two months ago to take up a job in a recently liberated country south of here. The bill was huge, not because he left his freezer on but because it included the newly imposed tax on private property. This tax has caused an uproar among Greeks since nonpayment can result in your own private blackout. They instantly dubbed it “To Haratsi,” in memory of a head tax levied on Christians in the Ottoman Empire, which every male over the age of 12 had to pay every year if they wanted their head to stay attached to their shoulders! I hadn’t been to the office in years so when I saw two doors, one marked payments and the other reimbursements, I naturally entered the first. And plucked a numbered ticket from a machine. The paper in my hand said 240, the number on the overhead board read 150. So I sighed and went outside to wait. As I sat on a bench, bundled up on this typically March day, the sun made furtive, feeble attempts to break through the gray clouds. But from a folding chair at the far edge of the building, an old woman had taken over the job of spreading cheer. 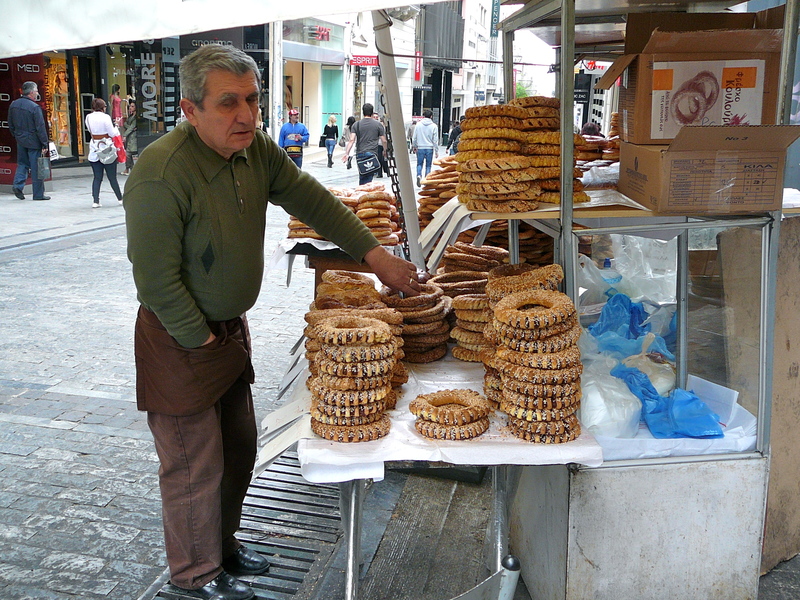 Wearing an ankle-length brown overcoat and a black and white wool scarf to protect her head and ears, she was selling “koulouria” – sesame rings – from a big nylon bag. But this was not one of those frail ladies in black that one sees often near the Central Market, who squat next to their wares with a pathetic pile of greens or a branch of bay leaves. No, this woman was an entertainer. Sometimes she would break into song with a deep throaty voice that was capable of piercing high notes, as if she’d come from the same nest as Yma Sumac. She must have been the life of the glendi at those country fairs round churchyards, where Greeks dance and sing all night. Maybe she still is. She brought a smile to many faces, even though they’d just been relieved of considerable sums of money. And she was certainly not shy. A woman lit up a cigarette on the bench next to me, and she said, “Kai to diko mou tsigaro, pou einai (and where’s my cigarette)? So the woman got up and offered her a Marlboro. From time to time, I’d get up to check the progress inside. When there were only about 50 ahead of me, I went myself to buy a koulouri. And took two, one white and one “diet” made of dark flour. Usually the size of bracelets, these were as big as halos. I complimented the woman on her voice and she beamed an almost toothless smile. Her name was Eleni, she comes to this corner next to the PPC office and has been selling her sesame rings every day, rain or shine, but not snow, for the past five years. She lives in Menidi, a working class suburb west of here. Before that she did odd jobs. She has a pension but it doesn’t go far and her son is unemployed. I’d been waiting half an hour before I overheard someone saying you could pay the haratsi in the second office without a number. So I went in the reimbursements door and stood in line for a mere five minutes. But for once I wasn’t angry at the misleading information. Eleni had given me a wonderful show, which I never would have enjoyed if I hadn’t sat on that bench for so long. I thanked her and said goodbye. Any time I want a free concert and sit-down comedy, I know where to go. Greece will never surrender with people like Eleni to keep our spirits up. I wish I could have taken her photograph, but I’d left home without even my cell phone. Here’s one instead of the koulouri seller on Ermou Street in central Athens. He doesn’t have an iota of Eleni’s survival qualities. 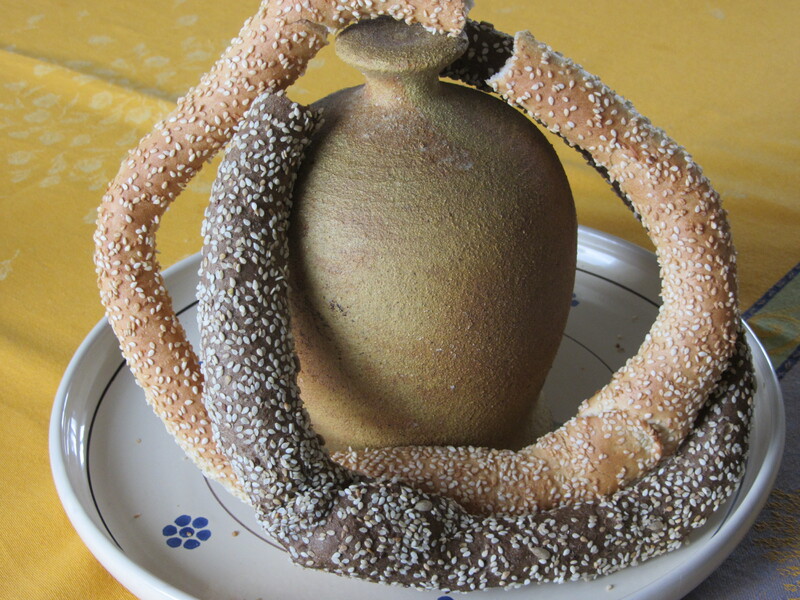 I’ve been meaning to make some koulouria of my own… they sell them here but not nearly in the variety and entertaining way that they sell them in Athens, I’m afraid! My grandfather-in-law (who died long before I met my husband) was a koupes seller in Cyprus. 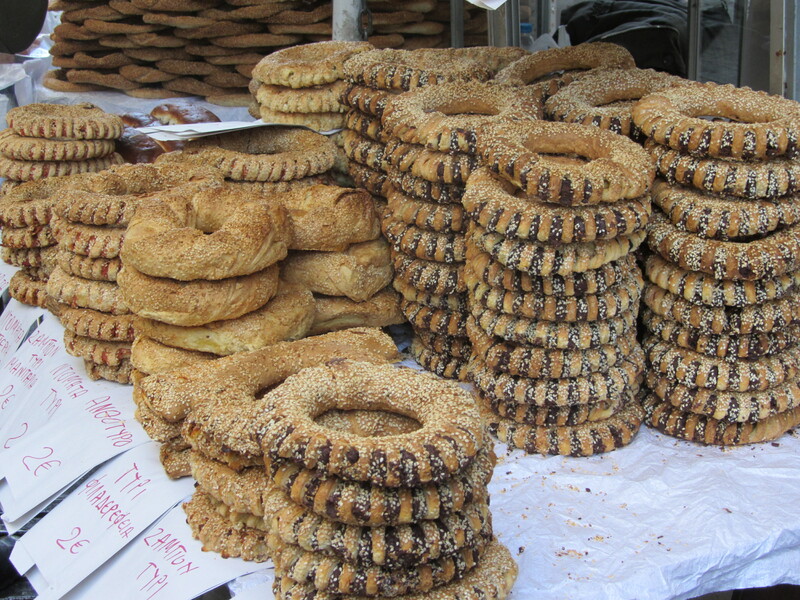 I guess koupes are the Cypriot version of koulouria, in that they carry them around on big trays and sell them on the street. I don’t really know what a koupa is, but apparently they were popular in Paphos back in the day. So I guess you could say that my grandfather-in-law was a sort of koulouria seller. I don’t know if he sang and cracked jokes though! Heidi, you have so many stories to tell. Let’s find out what koupes are. In Lesvos they’re little dishes or cups of trahana. I’ll write about them soon. Love hearing from you. What a lovely vignette of Greek life. Happiness can be found in many places. I used to buy koulouria for my daughter to wear and eat while she sat in her stroller, and I shopped. I still have a nostalgia for koulouria. Thank you for your introspective and happy story. Koulouria are definitely comfort food and full of nostalgia. It’s amazing how many types are on sale these days, but I’d never come across a seller with such a presence. Thanks so much for your comment. Stefanos says that they’re not like that in Cyprus. I just asked him to describe them and he said (I quote, translating): “they’re really really good. I don’t know what they are. They’re koupes with ground meat like a filling. I haven’t had one in 16 years, what do you expect from me?” hahaha. Thank you for sharing your experiences in Greece. Have you ever been to Lipsi Island? My family is from there, and my first novel Lipsi’s Daughter was a result of my visits there. Hi Patty, I’ve never actually met anyone with roots in Lipsi before though I have been there. Ages ago when we used to sail with friends around the Aegean. I remember a charming round plateia, a lovely tavernaki and some marides fried in the shape of fans (joined at the tails but spreading out), quite beautiful and very tasty. I must look for your novel. Have you written other books too? Thanks for writing. The plateia, taverna and fried marides are so indicative of the island lifestyle, and don’t forget the fried potatoes and Greek salad! Simple but delicious! By the way, Lipsi is also spelled Lipsos, or Leipsoi – and it is located in the Dodecanese islands next to Patmos. Yes, I’ve written two other novels and a poetry book. The Lion and the Nurse is a novel that takes place on Kos Island, and The Greek Maiden and the English Lord is a historical novel that takes place around the time of the Greek War of Independence. My poetry book Candlelit Journey: Poetry from the Heart is a compilation of several years of poetry, and there is a Greek section, too! If you do reviews on books, I’d be happy to send you a copy. Let me know! Thank you να σαι πάντα καλά! I’m touched, Demie, that you would like to put this on your own blog. Go right ahead. I tried to contact you through your blog and failed. I’ll try again. Thanks, Demie, Let me know when it’s up! but I will let you know when yours will be on. Thanks for the post, I enjoyed reading it, a much needed note of optimism to the continuous dirge of bad news we hear in Greece (granted, most of the news really /is/ bad). I’ve been reading your posts too, excellent and usually so sad. I will sign up and “follow” you.I’m trying to find the little glimmers of light.Thanks for taking the time to leave a comment.